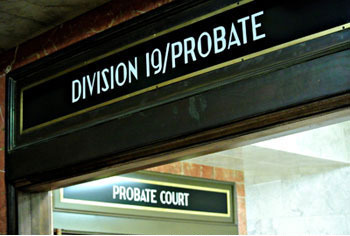 The Probate Division has jurisdiction over the estates of deceased persons and incapacitated and disabled adults and minors. The Division hears all litigation involving trusts, including those trusts established in wills. The Division hears cases involving the civil commitment to treatment facilities of persons who are mentally ill or who have substance abuse problems. The Probate Division also hears cases involving the institutionalization of persons alleged to be sexually violent predators. Finally, the Probate Judge accepts transfers from other divisions of cases that have a relationship to the administration of a probate case. The Probate Division is comprised of eight staff members, including the Probate Judge, Probate Commissioner, Deputy Probate Commissioner, Court Reporter, Law Clerk, and three Judicial Administrative Assistants. The Probate Records Department is comprised of 18 staff members, including the Director, Assistant Director, Supervisor, and fifteen Clerks. The Probate Division and the Probate Records Department are housed in both the Kansas City Courthouse and the Independence Courthouse. Effective June 16, 2017, all Probate Department staff performing auditing functions will work at the Independence office. You may visit the auditors at the Independence office. You may also contact them by phone. Effective June 16, 2017, all Probate Department staff performing new estates processing, settlement desk, and case action functions, will work at the Kansas City Office. You may visit them at the Kansas City office. You may also contact them by phone. Please note that you should continue filing your cases as you normally would and that no changes are needed on your part. Hearings will continue to be scheduled at the appropriate locations. You may continue to drop off original bonds and original wills/codicils and make payments at either location. This change only affects the physical location of some of the Probate Department staff. Information concerning procedures is available in the Probate Procedure Manual. Information concerning filing fees is available in the document Probate Filing Fees. Case information may be accessed via Case.net. All docket entries and cases closed prior to May 16, 2005 must be accessed on the Probate website. The hours of operation are 8:00 am to 5:00 pm. The Probate Department accepts payment in the form of cash (exact change is required), attorney or firm checks made payable to The Circuit Court of Jackson County, Missouri, and credit card payments. There is a $2.00 handling fee assessed to credit card transactions totaling $50.00 and under and a 4% fee charged for all transactions of $50.01 and above.